Great show. 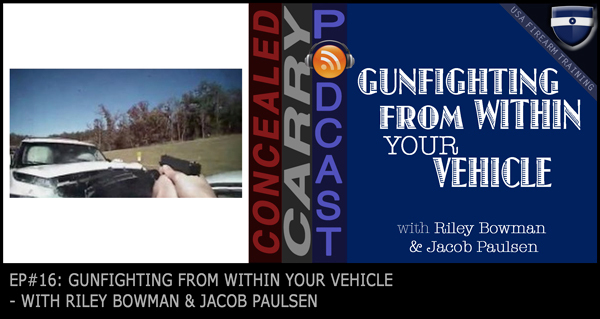 Love the topic, very important as many states extend the castle doctrine to your vehicle as well. Another great episode. Thanks guys. I had to say I have been appendix carrying for a year and I find it to be very comfortable while sitting whether in a car or any other seat. I carry a xd service model 4″ carried in a g-code incog with the mag caddy attached and will drive two hours to our cabin with no issue. I am rather fit and have no (tactical bulge) up front so that may help. As far as getting to the firearm my waist belt sits basicallt on my belt over the middle of the gun. I find with the seatbelt on if need be I can grab my shirt at my stomach with a firm grip and lift up between the lap and shoulder belt. The firearm is cleared. At that point I find it easy to draw or re-holster from the seat. Appendix of course isn’t for everyone but for me it works well. On a side note, I have trained myself to remove the seatbelt from the driver seat by using my left hand to run across my chest and under the shoulder strap. I then just reach over the latch and release. At that point by moving my arm toward the wheel the belt slips right over and off. Just wanted to throw in my couple cents. Thanks again for doing a fantastic podcast guys. Charles, it is working for me. Sorry if there was a temporary issue.